Welcome to the Podiatrist section of our website. FootCraft Orthotic Laboratory has supplied & repaired foot orthoses for podiatrists across Australia since 1999. We pride ourselves on the quality of our products as well as our reliable, prompt service. Our experience with many podiatrists throughout the country ensures we give you the best service & information available. Your completed orthoses will be dispatched within 7 working days from receiving casts. Overnight delivery via Toll Ipec or Australia Post is our standard delivery method. Generally the biggest delay is getting your casts to us. An overnight courier is usually the best option. Contact us for more information. Are your products computer or hand made? For many years we hand made all of our orthoses. After much research and development we implemented a new Cad Cam system we believe is the most accurate available. Many 'custom' made computer generated orthoses are manufactured using only the basic measurements of the scanned foot adapted to a generic design. This can be quite adequate in many cases, just as a chemist style 'off the shelf' insert can be effective but we believe it to be a compromise on a true custom made device. Our system allows us to make an orthotic of the same quality (or better) as we have always made. We still accept plaster casts and foam impressions, and no changes to your prescribing is required. Please contact us if you would like more information on this system. Plaster casts v Scans v Foam impression boxes v Fiberglass casts? We manufacture orthoses from all negative impressions and scans which aren't locked to a specific lab. Whilst we understand the convenience of foam boxes, we believe a better neutral impression can be gained with plaster casts. Foam boxes are very effective in capturing deformities for accomodative orthoses.The newer hand held scanners are a cost effective, accurate method of capturing the foot shape. Fibreglass casts are a new addition to the casting process. Our experience has found they do not always capture the foot shape very well and can result in a less than perfect foot impression. We can also accept most type of scanned foot images if you have your own scanner, or we can provide you with a low cost unit. Do you manufacture 'off the shelf' orthoses? We can provide an off the shelf orthotic if required. 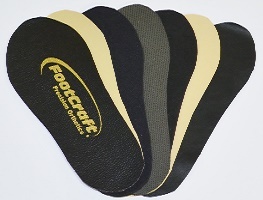 'QuickSteps' non cast orthoses available in 8 sizes. Contact us for more information. There are certain occasions including immediate availability to the patient and cost when non cast orthoses can be of benefit but too often they are being marketed as a custom orthotic. Our prefabricated orthoses are manufactured to the same standards as our prescription orthoses, and include a lower heel cup with moderate rearfoot and arch correction for patient comfort. Following are our prescription guidlines for use in conjunction with our prescription form. Both can be downloaded for your use in our download section. Also available is an online prescription form which enables you to complete the prescription & email directly to us. If we can be of any assistance -please don't hesitate to contact us. Please use this information to assist you in filling out our prescription forms. This is a guide only - please contact us if you require any addition or service not contained in this form. Completed orthoses are despatched within 7 working days from receipt of casts. If you require work returned earlier, tick the Rapid Return box (extra charge) and we will dispatch these items within 2 working days. Certain sections of our prescription form allow for your own personal preference without having to tick multiple boxes. Our separate ‘My Style’ form must be filled out if you wish to use these boxes. · Modified Root – Our standard orthotic device - forefoot balanced with a natural arch in line with corrected rearfoot. · A Medial Skive (Kirby) results from shaving plaster off the medial plantar surface of the heel section of the positive mold. This in effect adds extra medial intrinsic wedging to the device. Traditional Kirby Skives are traditionally ground at 15 degrees to varying depths from 2 - 8 mm. A higher than normal heel cup is advised. · The Inverted Technique (Blake) is balanced as per modified root devices but to a far greater degree of inversion (starting at 15 degrees). A 1-5 ratio is generally used to prescribe these devices i.e. for every degree of correction required you should request 5 degrees of inversion. Recent studies suggest that the ratio is closer to 1-3. Majority of control at medial calcaneus, with minimal arch control. If you require a different type of device or a hybrid of the above cast modification methods – please ask. Our anterior shell width is from just medial of the first met joint bisection to the lateral border of the 5th MPJ. A wide grind may be requested to provide extra strength, or when there is a concern about medial slippage in the shoe. We automatically grind children’s devices wider unless requested otherwise. Degrees inverted or everted from vertical heel bisection. We always balance the forefoot unless requested otherwise. Tick any of these boxes if you require any extra cast modifications, or if you require extra control in either the arch or talo-navicular area. A Cuboid Notch can help to lock the foot into the device and limits lateral foot movement. Select extra heel expansion for wider heel cup, minimal heel expansion for a narrow heel cup (this may cause irritation in some patients). No lateral heel cup removes all of lateral side of heel cup without narrowing heel width. A plantar fascia groove can be added to ease pressure on the plantar fascia. (Mark on cast to ensure groove is located in correct position). Extra plaster first ray assists first ray to plantar flex. · 4.5 mm Polypropylene is our standard plate thickness. 3mm or 6mm is available if required. · Superform carbon fibre composite is stronger & less brittle than other carbon composite materials. · EVA devices can be manufactured in various densities – please advise of density required. We will select the most appropriate material if lab discretion is selected. A Mortons Extension extends the shell underneath the 1st MTPJ to limit movement of the 1st Metatarsal or support a shortened first ray. Apertured heels can be added in varying sizes. PPT fill is added to any apertures. A First Ray Cutout removes material just proximal to the 1st MTPJ to aid first ray plantarflexion. If shoe fit is a concern a Low bulk grind should be prescribed. Extra material is removed from the lateral, medial, and heel cup area of the device. The plantar heel surface of the shell is also ground very thin (some sacrifice in control). Cobra - Centre of heel & lateral edge of shell removed. These devices are used when shoe fit is a concern, but have compromised control. Heel cup heights are approx 12 -14mm for females & 14 -16mm for males. Medial skives & lnverted devices may benefit from a high heel cup. A Medial Flare accommodates medial arch ‘bulging’. A Medial or Lateral Flange locks the foot in position by extending the orthoses up the side of the foot. Stabilising posts can be added where necessary. We recommend adding rear foot stabilisers to all larger devices and devices with large amounts of rear foot correction. Rear foot posts are recommended for all skived or inverted orthoses. Extrinsic posts are made from high density EVA and covered with a 1 mm HDPE plate unless requested otherwise. A Heel Raise refers to additional EVA being added to the heel post of the device to lift the rearfoot. EVA Arch Fill adds extra strength to the arch area of the device – please advise of density required. Forefoot posts can be inverted or everted if required or posted to neutral to add extra strength. · Shell - Shell covered only - no forefoot extension. · Web - Sulcus length forefoot padding & cover. · Full - Full length forefoot padding & cover. PPT in varying thickness' can be added to both the shell and forefoot. All forefoot extensions have 1.5mm PPT padding and a Cambrelle plantar cover unless requested otherwise. Metatarsal domes and accommodations made from PPT or EVA can be made in varying styles as required. All orthoses are covered in Vinyl unless requested otherwise. PS Vlies is a cotton polyester material with a high level of durability. It absorbs moisture and dries afterwards without any negative effects. Black in colour. Neoprene is good for friction reduction and may be useful for relief from blistering. Blue (3mm) & Black (3mm or 1.5mm) available. Leather absorbs moisture, but does not wear as well as vinyl. Vita Cover is an imitation leather material. Beige in colour. Multiform (aka Lunasoft) is a mix of EVA & Polyethylene with good strength and shock absorbing qualities, 2mm or 3mm thick, various colours including Blue, Red, Purple, Multicolour, Blue/ White Swirl, and Blue/ Green Swirl. Add any extra instructions or requests if required.